Doctors Called Her Memory Loss “Hopeless” – They Were Wrong! I will warn you however, this one is a very long and involved medical article. Be ready to do a lot of reading. “Hopeless” – They Were Wrong! Dear Health Conscious Reader,As we get older and our bodies and minds start to slow down, many people think there’s nothing that can be done about it. Of course this isn’t true. The truth is, there are natural solutions that can help you stay healthy and active for years to come. At 85, Ilsa’s future was looking bleaker by the minute. She couldn’t remember names, she had trouble recalling where she had been just hours before and she was forgetting what day it was.She was growing more agitated, so her worried daughter took her to a memory clinic. That’s when everyone’s worst fears were confirmed, and she was given a prescription, which her daughter actually believed made her cognitive problems worse. The story could’ve ended there, with an aging mother losing touch with reality and a heartbroken family helplessly standing by. Luckily, the memory clinic also tested Ilsa for vitamin B12 and the results caught her doctor’s eye. Her blood levels were well below normal, so he began B12 treatment immediately. Two years later, Ilsa was still independent and living in her New York home without outside assistance. Vitamin B12 did the trick! My name is Joshua Corn and I am the Editor-in-Chief of Live in the Now, one of the fastest growing natural health publications in the nation. My passion for natural healing drives me to spread the word about simple, safe and effective health solutions that can dramatically improve your life. Before you run out and grab a bottle of vitamin B12 to boost your memory and protect your mind, there’s a shocking secret about what most B12 supplements are made from — and you deserve to know about it. Please keep reading to learn how to safely increase your B12 levels and revitalize your health with the form of vitamin B12 that will do your body the most good. Is There An “Ilsa” in Your Family? Could It Happen to You? Right now, millions of American adults suffer the effects of low B12 and don’t even know it. They think they’re “just getting older” or worse — and like Ilsa they aremisdiagnosed by their doctor with conditions like advanced cognitive decline… depression… fatigue… insomnia… balance disorders… jaundice… paresthesia (that pins-and-needles tingling)…and then given drugs that don’t fix the problem and may make it worse. If you’ve experienced any of these symptoms, it’s imperative that you take action NOW before irreversible damage occurs. The good news is that B12 deficiency can be remedied easily, quickly and inexpensively. Joshua Corn, Editor-in-Chief of the Live in the Now newsletter, is a health freedom advocate who’s been involved in the natural health movement for over 15 years. He’s always been dedicated to promoting health, vitality, longevity and natural living. Josh is currently writing a book on natural remedies and is gearing up to launch the Live in the Now radio show. In addition to his work in the natural health field, Josh is an avid outdoorsman, organic gardener, animal lover and enjoys “living in the now” with his wife and two sons. I read about Ilsa in The New York Times, so I’m glad the mainstream media is finally catching on to an urgent problem I’ve been warning my readers about for years. The famous Dr. Mehmet Oz, recently devoted an episode of his TV show to“America’s B12 Deficiency” and why this is a national crisis in the making. How B12 deficiency can be so widespread in the richest and best fed nation in the world. This is crucial, because you could be at risk even if you eat a healthy diet. Why B12 in multivitamins and fortified foods may be completely ineffective. A false sense of security is the last thing you need. Which form of B12 works best… and why the most common form of B12 simply won’t deliver optimal results no matter how much you take. Scientists now understand that age-related cognitive decline is linked to a process in the body that involves a decrease in brain mass. That’s right, your brain actually shrinks as you age! This reduction in brain mass is directly correlated with loss of memory and cognitive function seen in older individuals. Emerging research is showing that being deficient in B12 puts your brain in serious danger, so if you care about your cognitive health, you better be sure that you’re getting enough. Recently, a landmark study showed vitamin B12 supplementation slows the rate of brain shrinkage and declining cognitive scores in older individuals. 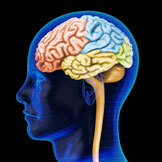 Another study showed that older individuals with higher levels of B12 in their blood had less shrinkage of the brain. Those with higher B12 blood levels and increased brain size even scored higher on memory and cognitive tests! B12 deficiency is part nature, part our own doing. For many people, it’s the result of multiple factors coming together in a “perfect storm” of trouble. Here’s why it is so easy to become dangerously low on this vital nutrient. Red Flag #1: You’re over 50. You see, B12 must first link up with a protein called intrinsic factor (IF), which is produced in your stomach. IF levels drop with age… which is why your B12 levels can plummet even when your diet remains the same. Red Flag #2: Common medications. Antacids, ulcer drugs or proton-pump inhibitors can trigger B12 deficiency because they block IF production. Likewise with aspirin and other medications that affect the stomach. Even diabetes drugs like metformin can trigger B12 deficiency. Indeed, research has documented the link between metformin, low B12 and impaired cognitive performance. Red Flag #3 and #4: Your diet and alcohol intake. Dietary B12 only comes from meat, poultry and seafood. So vegetarians are at risk — but so are folks who have simply cut back on their meat for health reasons, which is a lot of us! Plus, if you drink alcohol regularly, your ability to absorb B12 will be reduced. Red Flag #5 and #6: Intestinal problems and surgery. Conditions like IBS, Crohn’s, celiac disease, enteritis and food intolerances block B12 uptake at the receptor site. Plus any gastric surgery can reduce absorption, because it can eliminate stomach cells that produce intrinsic factor. Many people think their B12 needs are met by taking a multivitamin or eating fortified breakfast cereal. They are sadly mistaken. Taking just any old multivitamin for low B12 is like trying to fill a swimming pool with a teaspoon. First, the B12 in multivitamins may not even work. Research shows that the form of B12 found in many multivitamins may chemically interact with the other nutrients in the multivitamin and could be ineffective by the time you take it. Even if it remains stable, there’s a huge gulf between what you ingest and what you absorb. A lack of intrinsic factor could reduce your oral B12 absorption to as little as 1%. That’s why nationally known experts like Dr. Hyla Cass, M.D. of UCLA believe that the older you get, the more likely you’ll need to take significantly more B12 to offset absorption problems. Research shows it may take at least 200 times the current low RDA in order to successfully address B12 deficiency. So aside from its brain-protecting effects, why is ample B12 so important?First and foremost, you need B12 for normal DNA replication in every cell in your body. It helps you constantly generate healthy new cells that keep your body vibrant and your mind razor-sharp. When B12 is low, your body can’t produce enough new cells. That’s why B12 deficiency starts aging you practically overnight. It triggers all the bad physical and mental effects of growing old at the most fundamental cellular level. If DNA replication were B12’s only job, it would still be one of the most crucial nutrients of all. But B12 is the most biologically active vitamin by far. Convert carbohydrates and fats into energy. Extra B12 can help you enjoy greater energy, motivation and mental focus almost immediately. Regulate sleep cycles. Fixing a deficiency can help you sleep soundly again, so you get the rest you need and wake up refreshed every day. Keep nerve cells healthy and communicating with each other in an optimal manner — is critical for brain health and good physical balance as you age. Neutralize dangerous homocysteine in your blood, to protect your heart, bones, vision, and hearing from this well-known health destroyer. Keep your immune system working at its best, to help keep you healthy and illness-free even during cold-and-flu season. Many people who learn about low B12 make the big mistake of grabbing the first B12 they see at the supermarket. Unfortunately, most B12 supplements are made with cheap, low-grade cyanocobalamin B12. This is the most difficult form of B12 for your body to absorb. In addition, many B12 supplements come in pill form, which is problematic because many older people lack the ability to absorb B12 through their digestive tract. The very best B12 supplements are made with the superior methylcobalamin form of B12 and come in sublingual lozenges, so the B12 gets absorbed under your tongue directly into your bloodstream. Unfortunately, the B12 supplements that have “all the right stuff” are often prohibitively expensive. This is a shame because the high cost often steers people towards cheap, ineffective B12 supplements. I knew this was a big problem — and I was determined to solve it. You see, in addition to my work with the Live in the Now newsletter, I am also CEO of Stop Aging Now, a company that has produced premium nutritional supplements for nearly 20 years. Working with my Scientific Advisory Board, I created a vitamin B12 formula calledMAX-B12™. My goal in creating this formula was to offer a B12 product of superior quality at an amazingly affordable price, so that no one has to suffer the consequences of a B12 deficiency. How affordable is MAX-B12? Well if you act today you can get MAX-B12 for as little as $7.95 per bottle! MAX-B12 may cost the same or just a few pennies a day more than lowgrade supermarket B12, but its advantages are worth their weight in gold. Methylcobalamin is the active form of B12 that cuts through absorption obstacles much better than cyanocobalamin. That’s because your body doesn’t have to struggle breaking it down into a usable form. Methylcobalamin is also the purer choice. 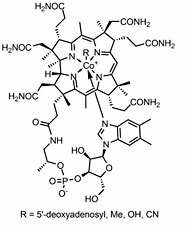 You see, cyanocobalamin consists of a cyanide molecule joined with a cobalamin molecule. That’s right: cyanide. And it can accumulate in your brain over time with disastrous results. That’s never a worry when you take MAX-B12instead. For a B12 delivery method, there’s no comparison to lozenges. B12 pills are hard to absorb. B12 liquids are messy and inconvenient. B12 sprays cost too much for what you get. MAX-B12 lozenges, on the other hand, are the perfect way to go: fast-acting, convenient, economical and pleasant tasting. You dissolve each MAX-B12 under your tongue, directly absorbing the B12 into your bloodstream. Sublingual absorption lets you sidestep typical absorption and enjoy nearly immediate boosts in your mental clarity, mood and energy. Many vitamin B12 supplements only give you 1,000 mcg a day of B12, which is far less than what you really need. Many leading experts recommend a daily intake of 3,000 mcg, which is the daily dose MAX-B12 provides. Most people find this an excellent level for B12 maintenance. However, if blood tests confirm that you are B12 deficient, you can safely increase your intake to 10,000-15,000 mcg daily until levels are adequate. Remember there is zero toxicity with B12 so it’s safe to take high doses. MAX-B12 is produced in an FDA-inspected facility and exceeds the strict quality standards set by the US Pharmacopeia (USP). You can be confident you’re taking the purest B12 available, in the form shown to be the safest and most effective for daily use. Quality and purity matter a lot. The market is flooded with low-cost vitamins from countries where facilities and processes may leave a lot to be desired. When you can get U.S.-produced MAX-B12 for about the same price, the choice is easy. How affordable is it? You can get MAX-B12 for as little as $7.95 per bottle for 90 lozenges (a one-month supply) for the finest-grade, U.S.-produced methylcobalamin in the superior lozenge form. That’s 9-cents-per-serving affordable! Add in FREE SHIPPING and no tax and you’re looking at an amazing deal — especially when you consider how much support MAX-B12 provides. 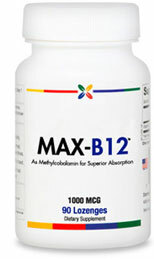 I take MAX-B12 daily, so I know it provides faster and better results than any other B12 I’ve tried, and I’ve tried plenty. I wouldn’t trade it for anything. But the choice is yours to make. That’s why I invite you to see for yourself risk-free what this premium-grade B12 can do. You can take it for up to one year and still get a full refund if you don’t like it. Return your purchase, even empty bottles, and I’ll send you your money back. It’s that simple. This entry was posted in Important Things To Know, Interesting Articles And/Or Pictures, Medical Situations, Natural Remedies, Other People's Experiences on December 9, 2014 by bonnie.